The Global NCAP (New Car Assessment Programme) is one of the most important agencies established under the Transport Research Department. The agency has also tested Indian cars and has released ratings based on their crash tests, to help buyers know the safety ratings of the car they might purchase. The Tata Nexon is the first Indian car to get a 5-Star safety rating and the Marazzo and Brezza with their 4-star rating are setting new standards. If you are in the market for a new car and safety is your topmost priority, here is a list of some of the safest Indian cars that are available under INR 10 lakh. 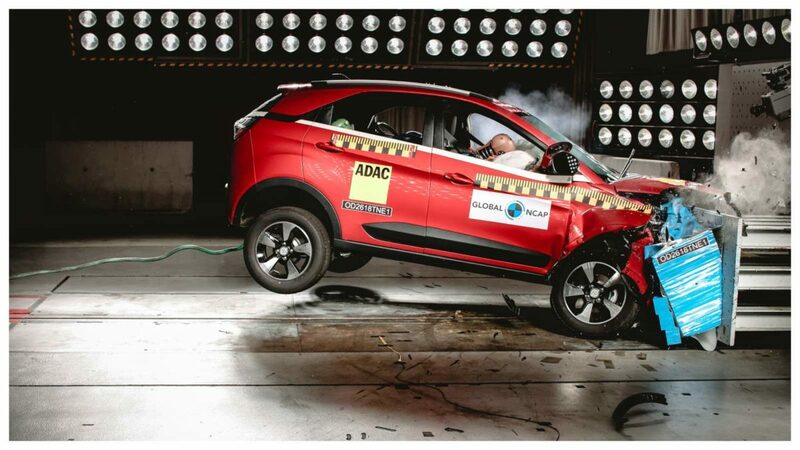 When the Tata Nexon was being tested for safety by Global NCAP, the bodyshell integrity was rated as stable and it was capable of withstanding further impact load. This was when the test was conducted at 64 km/h. The Footwell area was also rated as stable. The car is equipped with an SBR (Seatbelt Reminder) for the driver and passenger, along with a 4-channel ABS as standard. The vehicle also offers standard ISOFIX and top tether anchorages in the 2 outboard rear seats. Even though the Nexon is not equipped with side airbags, the head and chest of the passengers remain safe in case of an accident. 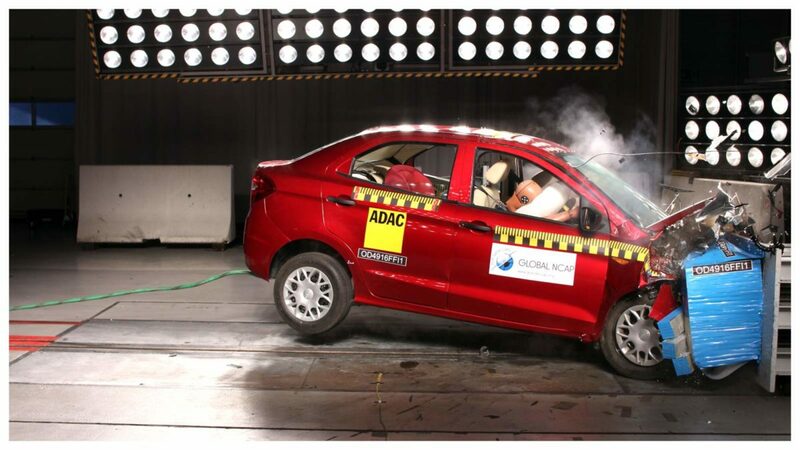 This makes the Nexon the first Indian-made car to score a full five-star Global NCAP rating. Prices for the Tata Nexon start from Rs 6,53,026 (ex-showroom, Mumbai). 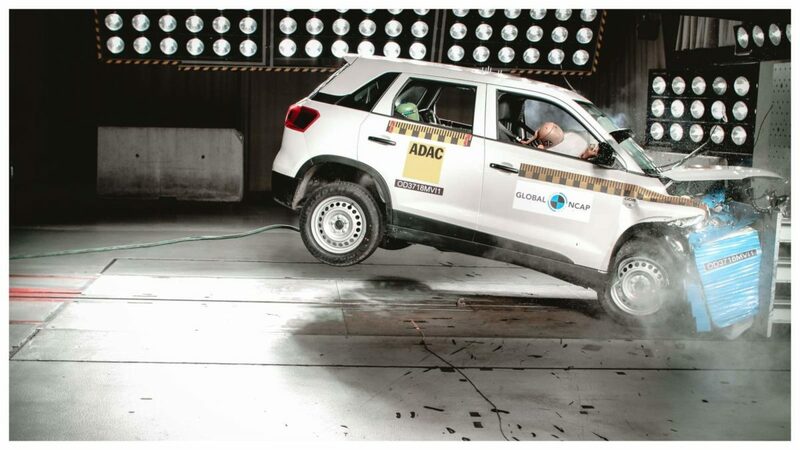 In the Maruti Suzuki Vitara Brezza crash test, the car was tested at 64 kmph. The bodyshell integrity was rated as stable and it was able to take extra impact load. The driver and passenger dummies showed that the chest and head get marginal protection and the knees only get a slight amount of protection from the frontal impact. The car offers a Seatbelt Reminder for the driver, along with 4-channel ABS as a standard safety feature. The rear seats showed poor protection for the head and limited protection for the chest. The vehicle also offers standard ISOFIX and top tether anchorages in the 2 outboard rear seats but, does not offer 3 point belts in all seating positions. The prices for the Vitara Brezza start at Rs 7,78,264 (ex-showroom, Mumbai). In the Toyota Etios Liva crash test, the car was tested at 64 kmph. The bodyshell integrity was rated as stable and the car was still able to withstand further impacts. The driver and passenger’s heads were both well protected by the airbags and seatbelts, as both seatbelts were equipped with pretensioners. However, there were hazardous structures in the area below the knee that could cause injuries. The biomechanical limits of the child dummies were reached during the test, as there was no possibility to disconnect the passenger airbag. The Liva is now equipped with ABS and a Seatbelt Reminder System. The prices for the Toyota Etios Liva start from Rs 5,63,400 (ex-showroom, Mumbai). 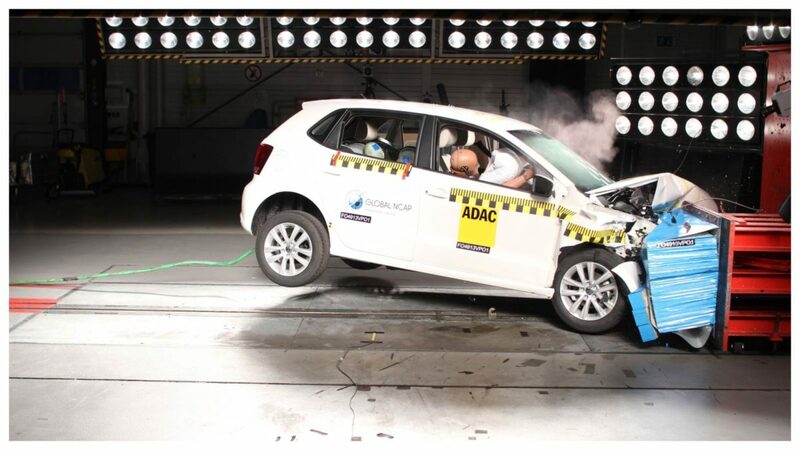 In the Volkswagen Polo crash test, the car was tested at 64 kmph. The bodyshell integrity was rated as stable and the car was still able to absorb further impacts. The driver and passenger’s head and neck were safely protected because of the airbag, while their chest received adequate protection. The knees could have been injured due to the tube structures below the dashboard. In terms of child safety, the car did give warnings about the hazards of a rearward facing child seat on the front passenger seat with an active airbag, but its marking is not enough to meet the protocol criteria. The new Polo is now equipped with an ABS, but it still doesn’t get the Seatbelt Reminder. The prices for the Volkswagen Polo start from Rs 5,71,500 (ex-showroom, Mumbai). 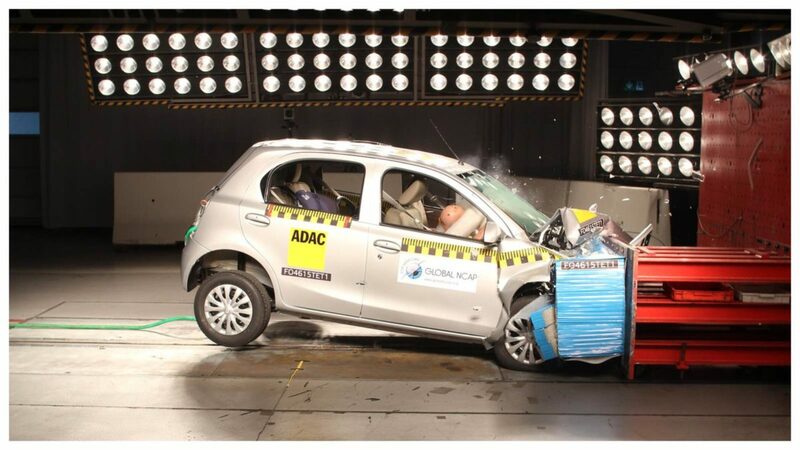 In the Tata Zest crash test, the car was tested at 64 kmph. The bodyshell integrity was rated as unstable and the car would crumble under any further impact. The driver’s head receives an adequate amount of protection, while the chest gets marginal protection. The Passenger’s head and chest stay completely protected, but the knees could be injured from an impact with some dangerous structures in the dashboard. The car is equipped with a driver Seatbelt Reminder and ABS. The vehicle was also equipped with a passenger airbag which could not be disabled. The prices for the Tata Zest start from Rs 5,79,050 (ex-showroom, Mumbai). 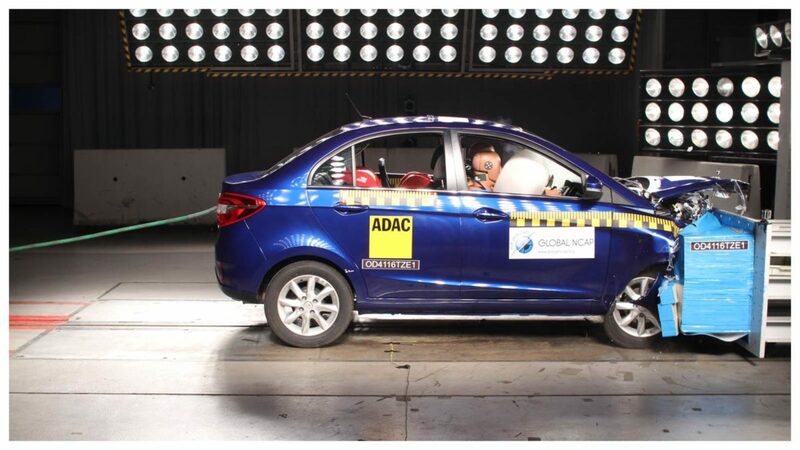 In the Ford Aspire crash test, the car was tested at 64 kmph. The bodyshell integrity was rated as unstable and the car could not take any further impacts. The driver and passenger’s head and neck were well protected by the airbag. But, the driver’s chest had weak protection while the passenger’s chest received marginal protection. The front passengers’ knees could impact with dangerous structures in the dashboard like the Tran fascia tube. The installation instructions for both child seats were insufficient and were not permanently attached to the main-seat. The vehicle is equipped with a passenger airbag, but it cannot be disabled in order to prevent high risks of injuries. The new Aspire is now equipped with ABS. The prices for the Ford Figo Aspire start from Rs 5,71,000 (ex-showroom, Mumbai). 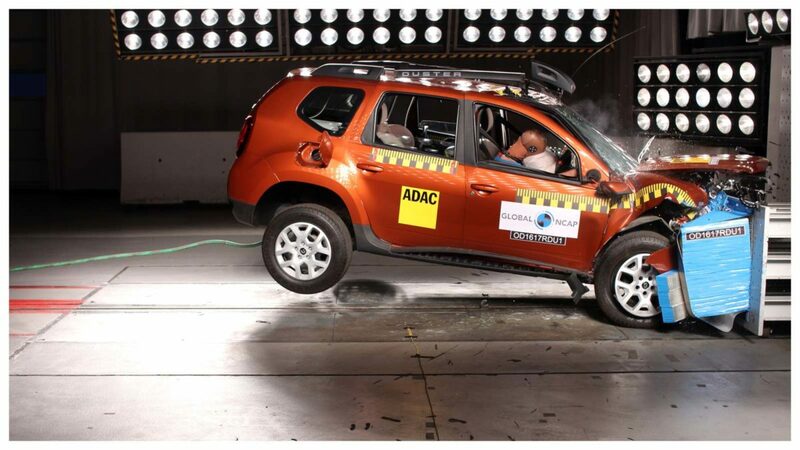 In the Renault Duster crash test, the car was tested at 64 kmph. The bodyshell integrity was rated as unstable and the car could not take any further loadings. The driver’s head only received adequate protection due to the unstable airbag contact, while the driver’s chest wasn’t well protected. The passenger’s head protection was good and chest protection was marginal, but the front passengers’ knees could be injured. The installation instructions on both child seats were insufficient and they were not permanently attached to the seat. The new Duster now gets an ABS, along with dual front airbags. Prices for the Renault Duster start from Rs 7,99,900 (ex-showroom, Mumbai).